Humoral Medicine is based on the 'fluids' of the body, or perhaps more properly, 'that which flows'. Greek, Unani, Indian and Tibetan Medicine are all classed as Humoral systems of Medicine. Only TCM is not classed as a Humoral Theory although in basic philosophy, it shares many aspects with the Humoral Medicine system. Various authors have stated that the Western Humoral theory is only physical thus separating it from the likes of the Eastern systems and TCM, but this is not true. It clearly has both physical and energetic aspects. The Humoral Theory of the Western Tradition is ancient. While it is commonly attributed to the ancient Greeks, and Hippocrates in particular, it was almost certainly evolved from the earlier Egyptians and possibly other sources such as India and Mesopotamia. Pythagoras (570–495BCE) was known to have traveled widely, and was said by Eduard Zeller in his History of Greek Philosophy to have even visited the Brahmans where he could have obtained aspects of Indian Humoral medicine. Thales of Melitus (624–546BCE) was known to have studied in Egypt. However, Humoral Medicine was certainly systematized by the Greeks. The development of the Humoral theory in the Western Tradition was a gradual one. Timotheos of Metapont first stated that most diseases were caused by Phlegm coming down from the Brain. Later, Herodikos stated that there were two opposing Humors, Bile and Phlegm (analogous to the Yin and Yang of TCM). Philolaos then said Blood was a third cause of disease. Interestingly, Plato recognised Wind as the Third Humor, being the same as the Ayurvedic Dosas (Wind, Bile and Phlegm). Polybos, the son-in-law of Hippocrates divided Bile into Yellow and Black, thus creating the 4 Humors (Winder). It appears that the Greek Humoral system was probably influenced from both ancient Egypt and India. 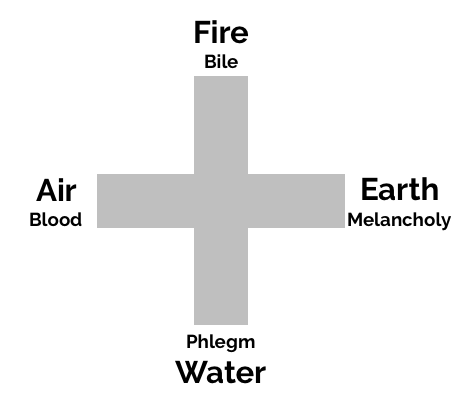 Empedocles (around 450BCE) was responsible for connecting 4 Humors with the 4 Elements of Fire, Water, Earth and Air. ﻿What are the Humors ? The term 'Humor' is from the Latin meaning fluid. Thus, the Humors are the fluids of the body. These Humors are directly derived from the Food and Drink we ingest. However, more loosely, the Humors can be looked at as the energies of the body. The Phlegm Humor, for example, relates to mucous, phlegm and bodily fluids in general, but feelings of heaviness and mental dullness are also associated with the Phlegm Humor. This illustrates that the Humors are both physical and energetic. We could perhaps think of them as 'that which flows' (like fluids), rather than fluids. A number of authors have tried to suggest that the Humors of the West are separate from the Humors of the East (Ayurveda and Tibetan). The Western are purely physical and the Eastern are energetic and more subtle, they say. But careful study reveals this is not correct. The Humors have a physical counterpart, just as Kapha of Ayurveda does. But both also have more subtle connotations and this is evident when studying Traditional texts. However, it is true to say that the Greeks were more focused on Physical aspects whereas the Eastern system tended to be a little more energy-centric. The Four Humors of the Western Tradition are Blood, Bile, Phlegm and Melancholy. While there was accepted to be 4 Humors (to fit in with the 4 Elements of Nature), there were actually Three Humors and Blood, Blood being composed of the other 3 Humors, and 'Blood' being taken as the whole, the individual Humors being portions of the Blood. However, 'Blood' also stood individually as one of the Four Humors, the red (hemoglobin) portion being called 'Blood Humor'. This, then, is very similar to the Ayurvedic concept of the Humors where there are Three Humors (Dosas–Vata/Wind, Kapha/Phlegm, and Vata/Wind) along with the Blood. And these Humors (Dosas) work intimately with the Blood. Thus, various authors have stated that the Greek system, or rather systemisation of the Humors was most likely based on ancient Indian texts. However, it is also likely the the ancient Indians may even have been influenced by the Egyptians or Mesopotamians. Nevertheless all the Humoral systems have directly or indirectly influenced one another and the fundamental principles are remarkable similar. The Four Humors are composed of 2 pairs of opposites: Bile and Phlegm, and Blood and Melancholy. Hot and Cold are primary and Dominant, Dryness and Moisture being secondary to Hot and Cold. Hot and Cold, manifested by Bile and Phlegm in the Humoral system, ultimately equate with Yin and Yang of the Chinese system. They represent a pair of primordial opposites that balance one another. The Heat of Blood and Bile balances the Coldness of Phlegm and Melancholy. The moisture of Blood and Phlegm counters the dryness of Bile and Melancholy; the warmth of Blood and Bile restrain the dryness and coldness of Melancholy; the dryness and earthiness of Melancholy restrains the Heat and thinness of Bile. Thus the Humors when in correct amount balance one another to maintain Health. This is classically illustrated with the equal-armed Cross. 1. As everyone has a predominant Humor, everyone has a constitution based on their predominance. 2. An individual can have a constitution of one type, but have a disease of another type, for example be a Phlegm (Cold and moist) constitution, but have a Heat disease such as an acute infection. 3. It is possible to have differing Humors affecting different organs, for example Coldness (Phlegm) of the Kidneys and Heat (Bile) of the Liver. In such cases, complex formulas or multiple formulas may be used to treat a condition. The Primary imbalance of the Humors is the loss of balance, as illustrated above. However, the Humors can have various other disorders. During digestion, the Humors may be ill-formed or burnt, the former from lack of digestive heat, the latter from excess Heat of the Stomach or Liver. So any of the Humors may fall away from correct temperament. For example Phlegm will be thick and heavy when mixed with excess Cold, but becomes thin and sharp if overcome with Heat; Bile becomes thin and piercing when there is excess Heat, but loses Heat if combined with Cold. Any of the Humors, when burnt, may result in Melancholy Humor. 1. Once Individual Humors and Pathology is identified, Diet and Lifestyle advice is given to stop feeding the imbalance. 2. Humoral treatment aims to balance the Humors for eradication of disease and promotion of Health. 3. Purging is used in Excess, strengthening is used in Deficiency. For example, excess Phlegm in a strong person is purged, Phlegm or Damp in a weak person is treated by strengthening Spleen and Kidney. 4. Excess of the Humors is removed from the body by Vomit (Phlegm), Bleeding (Blood) and purging, although all Humors and excesses can be removed by Purging. 5. Purging has three parts: Preparation, Purging and Strengthening. 6. Preparing is used to separate, loosen, ripen and collect the Humor for Purging. 7. Purging is taking medicines to clear the Humors. Actual purging may only be several days, or perhaps once a week, preparatives or strengtheners used in between. 8. After cure, strengthening medicines should be taken to prevent the increase of the Humor again.